President Sung-Chul Shin shared his ideas on how reskilling is a critical element of growth, dynamism, and competitiveness for countries during a session titled “Closing the Skills Gap: Creating a Reskilling Revolution” at the World Economic Forum on January 24 in Davos. While discussing a reskilling imperative alongside French Labor Minister Muriel Penicaud, he presented how the Korean government and KAIST are responding to the socio-economic transformation of workforces in the Fourth Industrial Revolution. After their presentation, Minister of Economy and Enterprise of Spain Nadia Calvirno Santamaria, Minister of Commerce and Industry of Oman Ali bin Masoud bin Ali Al Sunaidy, and Minister of Petroleum and Natural Gas, Skill Development, and Entrepreneurship of India Dharmendra Pradhan shared their views on the course of decision making regarding the proactive practices and policies they have applied for closing the gaps from their countries’ perspectives. President Shin presented how to upskill and reskill SMEs and startups, the real players who will jumpstart the economy in the Fourth Industrial Revolution. He explained that the government is striving to change the existing structure of the economy, which is dominated by a few giant conglomerates. He added that the Korean government is trying to support SMEs and startups in terms of both funding and technology reskilling in order to rejuvenate the economy. To better align itself with the government’s efforts, KAIST has introduced SME 4.0. SME 4.0 proposes to innovate the production process through the creation of a partnered platform between KAIST and SMEs across the country. With this platform, KAIST assists local SMEs for standardizing and systemizing all their processes of production, delivery, and management with enterprise resources planning (ERP) and manufacturing execution systems (MES). In addition, SME 4.0 offers retraining and re-tooling programs by linking the data generated through this platform in real time to better facilitate SMEs’ smart business. President Shin also explained about upskilling the leading corporations’ technological competitiveness, partnering with major leading corporations for upskilling their advanced technologies. He also held a series of bilateral meetings with dignitaries attending the WEF annual meeting to discuss partnerships and collaborations. He also attended the Global University Leaders Forum (GULF), a community composed of 28 presidents from the world’s top universities on January 23. 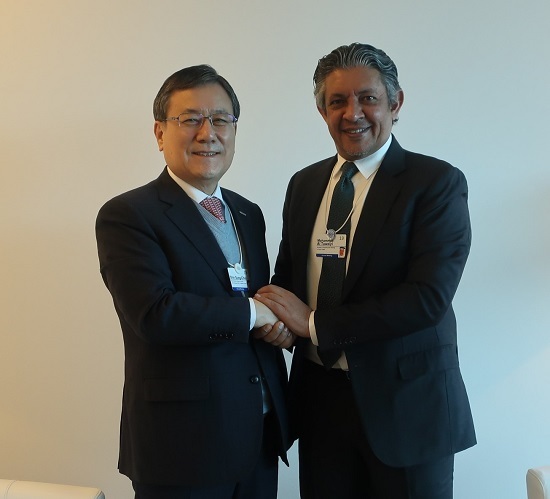 President Shin, who is on the advisory board of the Center for Fourth Industrial Revolution (C4IR), also participated in the board meeting and discussed the upcoming launching of the Korea C4IR, which will open at KAIST in March.